Warning: mistreated recipe! If you have any intention of using those chewy curly no-boil lasagna, lumpia/wanton wrappers, manicotti tubes, tortilla, frozen crepes or other horrors please don’t even read this recipe. In fact, you might want to go out for dinner or make mac n’ cheese. Like lasagna, this is a labor-intensive pasta recipe. It’s a dish of sublime goodness which deserves to be revered and prepared with loving care for the appropriate (grand) occasion. The effort will be totally worthy, I promise you. The success of this dish is based on high-quality ingredients, a restrained amount of sauce, a relatively dry but wonderfully savory filling. By the time it is ready to eat, the pasta should remain al dente. 700 gr (1.5 lb) good quality ground red meat. I use a mixture of pork and beef. 60 gr (2 oz) finely grated Pecorino or Parmigiano-Reggiano plus two tablespoon for sprinkling. If you use your own pasta sheets you will need to triple my basic pasta dough recipe. Make them the day before, let them dry completely, covered with a thick kitchen towel so they will not curl up and break. Storing at room temperature is OK for one day, otherwise freeze the individual sheets and keep in a freezer box until needed. As an alternative buy the thinnest possible lasagna noodles. Preparing the tomato sauce and blanched spinach in advance also helps with time management. In a shallow heavy-bottomed pan saute onion, carrot and celery with two tablespoons extra virgin olive oil. This is called a soffritto. When the vegetables are translucent, increase heat, add ground meat and saute quickly until just starting to brown. Deglaze with white wine, season with salt, nutmeg and black pepper and set aside to cool. In a food processor, pulse ham, spinach and grated Parmesan until finely ground. Add to cooked ground meat together with 2-3 tablespoon tomato sauce. Do not use frozen spinach, they tend to retain too much water. 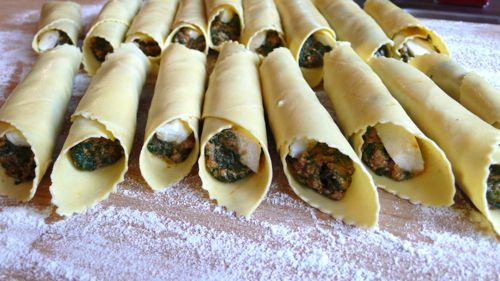 If the filling is too moist the cannelloni will fall apart during cooking. Bring a large pot of salted water to rolling boil, add 1 tablespoon olive oil. Boil pasta 10 pieces at a time in a large pot, stirring lightly to separate, until just tender, about 1/2 minute for fresh pasta or about 3 minutes for dry noodles. Drain in a colander. Using thick rubber gloves gently transfer the pasta sheets on a clean work-top and lay them flat to cool. Preheat oven to 200 °C (400°F). Spread about 2 tablespoon filling in a line along the diagonal of 1 pasta rectangle, top with a slice of mozzarella…..
……then roll up to enclose filling. Transfer them to a baking dish arranging snugly in 1 layer. 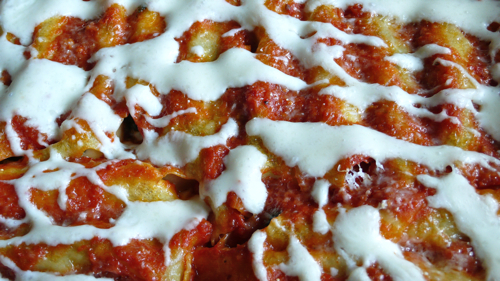 Spread cannelloni with a thin layer of tomato sauce, drizzle with Bechamel and sprinkle with 2 tablespoon grated cheese. Bake in the middle of the oven until the sauce is bubbling, about 25 minutes. Let them stand 5 minutes before serving. 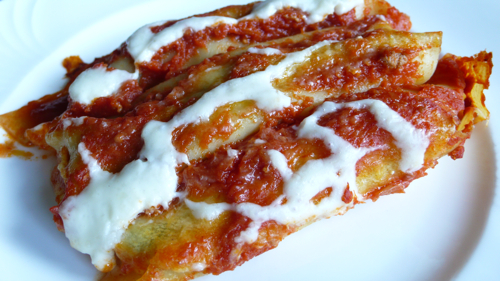 Cannelloni are ideal to serve a crowd, each piece just lifts out of the baking dish in a perfectly sized portion. In addition they can be frozen uncooked. Just make sure to thaw them completely before baking. Funny thing is the past two weeks I have been thinking of making cannelloni, but haven’t had the time. Now I’m really drooling and don’t know how much longer I can last without a taste. This weekend must be the elected weekend. These are beautiful! I can not wait to try:). I really want to go to the B&B! thank you for visiting Merge! Mind if I link it to my blog? thank you very much, lovely to meet you! They look really yummy, I love Italian pasta. When I was 10 years old I visited Italy with my parents…the story is still told…but I ate these Cannelloni every time we went to a restaurant (which was almost every night for 2 months). I was in love and can never forget the pure magnificence of their taste. Now I am Gluten Intolerant and have not yet mastered homemade gluten free pasta…once I do- this is what I will make. Thank you for sharing this spectacular dish with us! thank you for your lovely comment. I have also always loved this dish, my mum used to make it every big holiday. 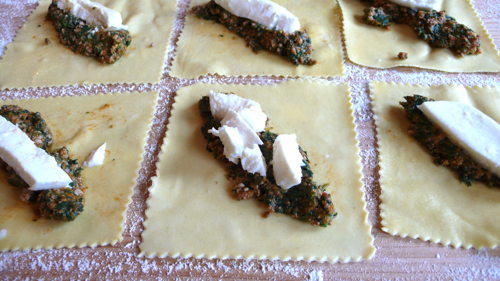 I think it is possible to make a gluten free version of it, please give a look to my recipe for gluten free ravioli. You could use the same pasta dough recipe and cut it into square. You will however need to blanch the pasta sheets very briefly, 20 or 30 sec. my lasagne pasta dried curled and cracked. Any tips? Did you add any water? What flour did you use? Semolina? All purpose? I use 00 Italian flour which is equivalent to pastry flour. It’s the easiest to handle and gives the best results. All pupose flour, only eggs and flour. The fettucinne dried and tasted great. I broke up the curled sheets and added it to soup, also good. Where is your recipe? I am convinced that the problem is in the quality of the flour. If the dough is too sticky the pasta does not dry well. Your dough has to be soft enough to go through the pasta machine (I am assuming you use one) but still quite firm. Sometime it’s just that bleached flour has been so “mistreated” that no matter what you do the dough will react strangely to any manipulation. Try changing the flour and see what happens.